Jeff Kinney's Diary of a Wimpy Kid books have sold 43 million copies. As the second film spin-off arrives in UK cinemas, the American author talks about cartoon kids, reluctant readers and why he's not giving up the day job. Jeff Kinney picks up a pen a draws his most famous creation in just a few seconds. Meet Greg Heffley - a boy with dots for eyes, three strands of hair and a glum expression. The Diary of a Wimpy Kid books have been a huge hit since they first appeared in 2007. Presented in a handwritten font - with Kinney's trademark cartoons - the books tell the story of middle-schooler Greg and his flawed family. But when it came to the big screen version, Kinney's cartoon family became flesh and blood actors. "It was a most important decision because what my books lack is an emotional centre," says Jeff Kinney with disarming honesty. "My books are gag delivery systems. People don't really care about the characters. So I think bringing that humanity to the characters was a smart move." 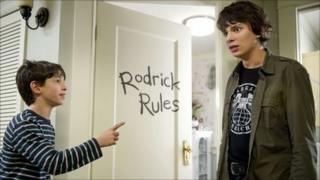 Diary of a Wimpy Kid: Rodrick Rules - a sequel to 2010's first film - sees Greg and his older brother having to deal with their parents' misguided attempts to make them bond. Kinney admits he was initially "on the fence" about turning the books into films. But as executive producer, he has been closely involved in all stages from casting to post-production. The irony is that Kinney had originally targeted his Wimpy Kid stories at adults. "I was trying to write a nostalgic book looking back on childhood. "I imagined Diary of a Wimpy Kid as one big fat book for grown-ups and my publisher broke the news to me that I'd written a children's series - which was a shock to me." How much do the Wimpy Kid's experiences reflect Kinney's own childhood? "The books wouldn't exist if I hadn't lived the life I've lived. There's a moment in the second book where Greg is on the starter block at the swimming pool and his father is telling him to to stop shivering. "A lot of that is straight from my own life and that's sort of where Greg was born - on the swim team." As with JK Rowling's Harry Potter series, Kinney's books have been credited with getting children - especially boys - into reading. Parents and teachers got in touch to say how the Wimpy Kid stories were popular with "reluctant readers". "I heard that again and again," says Kinney. "I didn't know at the time that 'reluctant reader' is a code word for a boy. I feel privileged to be writing for boys and I have a lot of fun with that." I've decided to keep Greg the same age for ever. With five Wimpy Kid books published, and a sixth due in November, Kinney admits he has no idea how the series will end. "My master-plan ended with the fifth book where I realised that Greg is a cartoon character, not a literary character, and that his DNA is in comics. That's why I've decided to keep Greg the same age for ever. "I don't have a feel for how many books the series should last, but I'm definitely going to try and quit while I'm ahead." But despite his success, Kinney has no plans to quit the day job. He works for the Pearson company on its children's virtual gaming world Poptropica, which features a Wimpy Kid-themed area. "It's educational and entertaining and it's a privilege to reach 10m kids a month with these stories - so I'm going to stick with it as long as I can."